Learn how to make Lebanese baklawa with confidence, ease, and joy! Here you will make phyllo your friend, clarified butter your baby, toasty ground nuts your nirvana. And flower water syrup—that sweet simplicity that distinguishes Lebanese baklawa from all other baklavas—your pure, aromatic nectar. Let’s go! Making baklawa is a little like math, which is an odd thing for me to compare it to since math and I have never been on great terms. But I’ve been witnessing (well, from my perch in the kitchen) some seriously successful math-tutoring at our house recently, and I see how it works. When you break it down into its many parts and come to understand each part really well, then the whole becomes a solvable, not-so-scary project. 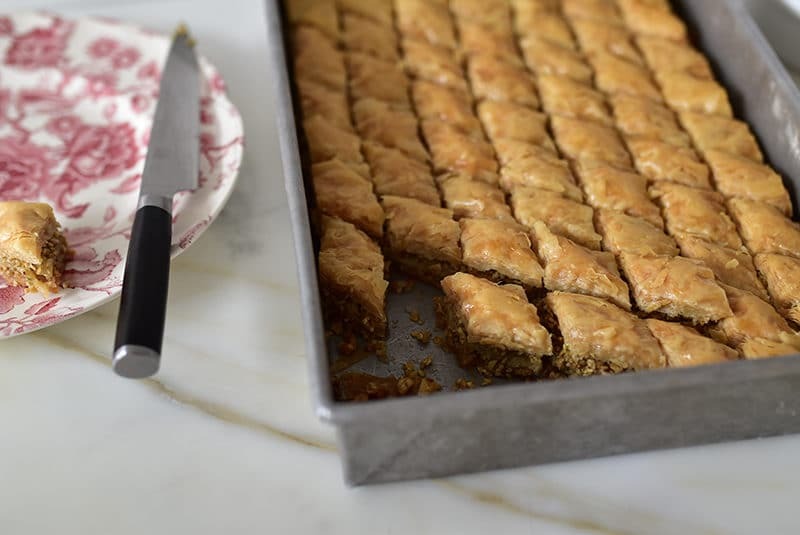 This is how it is with Lebanese baklawa: there are many parts, and each one has certain nuances that when truly understood, work to make a pastry that is not so mysterious or far-reaching to welcome into your baking repertoire. The final equation, the end result, is so satisfying and wonderful that it is clear why baklawa is the most classic pastry of the Middle East. Over the years that I’ve been baking baklawa, I’m always learning, keeping notes, trying new ways. Being a baklawa student means that how I did things in the past may not be how I do them today, and how I do it tomorrow may also change. 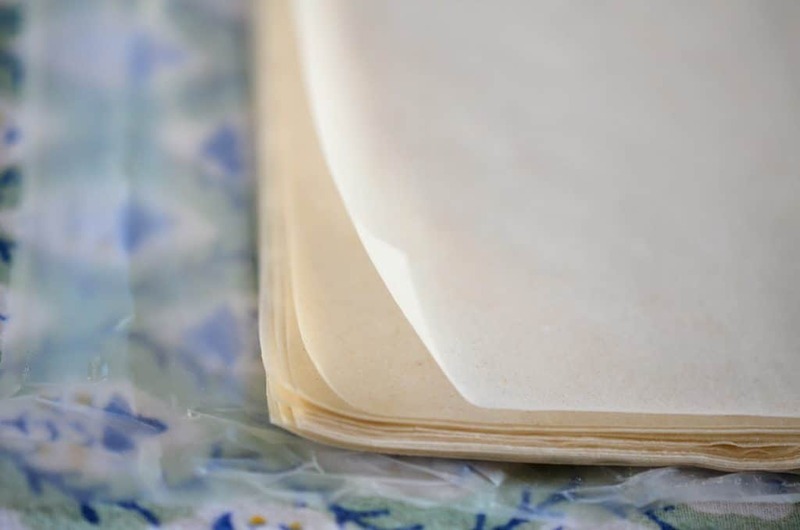 Which in turn means that blog posts, cookbooks, and the like are a snapshot of a point in time sharing what I knew and did then. Some things of course stay the same, and others will change, but always with refinement and improvement as the goals (hi, perfectionists!). Baklawa (pronounced bahk-LAY-wa or even bit-LAY-wa, and sometimes: bit-LAY-wee) is the Lebanese pastry of phyllo, clarified butter, nuts, and flower water simple syrup. Lebanese baklawa is different in flavor than Greek or some Turkish baklavas. Baklawa is made in a variety of shapes and sizes, but homemade baklawa is typically rolled or layered and cut into diamonds. All of the baklawa bakers I have known prepare the various parts of the pastry in advance, so that on baking day baklawa is mainly an assembly project of phyllo, nuts, cutting, buttering, baking, [smelling the aroma] and drenching in syrup. The end. Oh, and eating. Phyllo is tissue-thin dough that is found in boxes in the frozen dessert section at the grocery store. My favorite brand is Athens, for its flavor and reliable thinness. It’s a bonus that this is the brand found in most any grocery store that carries phyllo! The key with any brand you buy is thinness, as phyllo is made in varying thicknesses that are numbered. The one you want is #4. 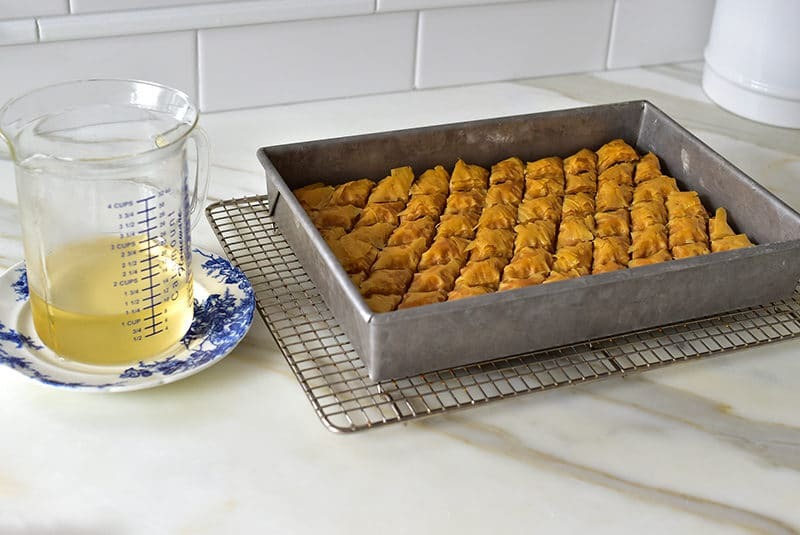 Phyllo sheet size typically comes in two options: 9×14 and 14×18. The most readily available, grocery-store size is the smaller 9×14. The large size is often found at specialty food stores and is desirable when you want to make large sheet pans, wedding/funeral/big-stuff baklawa. I use the 9×14 size most often because it fits nearly perfectly into a 9×13 pan and that is the size of the recipe I use most often (and it still makes about 50 pieces). Phyllo should be thawed overnight in the refrigerator and then brought to room temp a couple of hours before baking. Once the plastic sleeves of phyllo are cut open, make fast work of it as the phyllo dries out quickly. 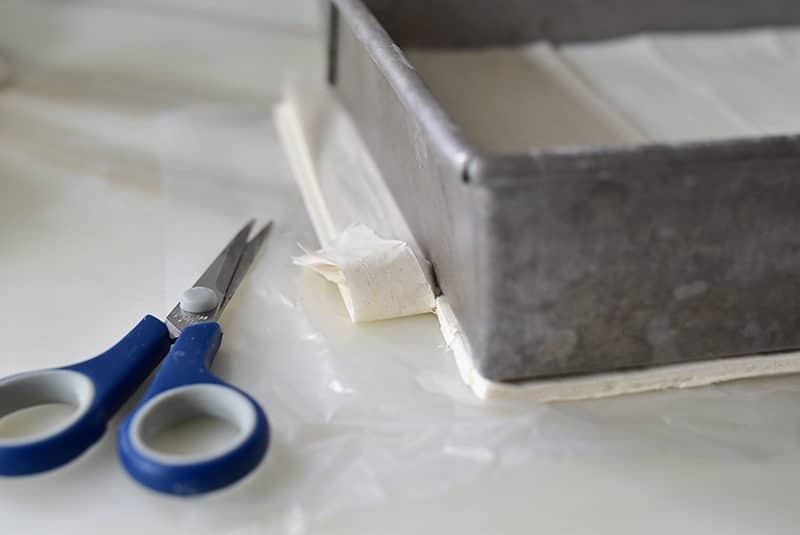 Once the phyllo is opened and laid flat, cover it with plastic wrap or wax paper and a damp kitchen towel to protect it as you work. Lebanese baklawa is drenched in syrup flavored with flower water (not to be confused with flower extracts. Get perfect bottles of my favorite flower waters here). Some recipes use a combination of rose and orange blossom water. 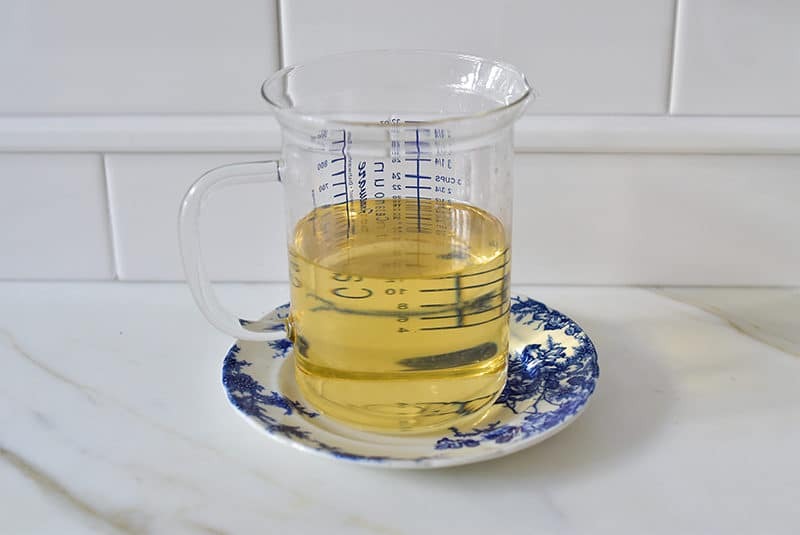 I use orange blossom only, and I measure it away from the pan of syrup so I don’t make a mistake and over-pour into the syrup. Unlike vanilla extract, this is a flavoring that must be used with restraint. I always called this “simple syrup,” until I learned that simple syrup is simple because it’s a 1:1 ratio of sugar to water. My syrup recipe (find it here) has more sugar than water, but it’s still pretty darn simple. Take care not to cook the syrup too long. Use a timer just to be sure to nail it every time (5 minutes simmered after bringing to a boil). I like to double the recipe so that I always have syrup chilling in the refrigerator, just in case I want to whip up a batch of baklawa (yes, you can WHIP UP baklawa!). My cousin John Abowd (blood, real cuz!) made an off-hand comment once that the best baklawa he’d ever made was using local cultured butter in France. Well la-dee-da! And thank-you-John! I started using cultured butter for my baklawa after that and never looked back. 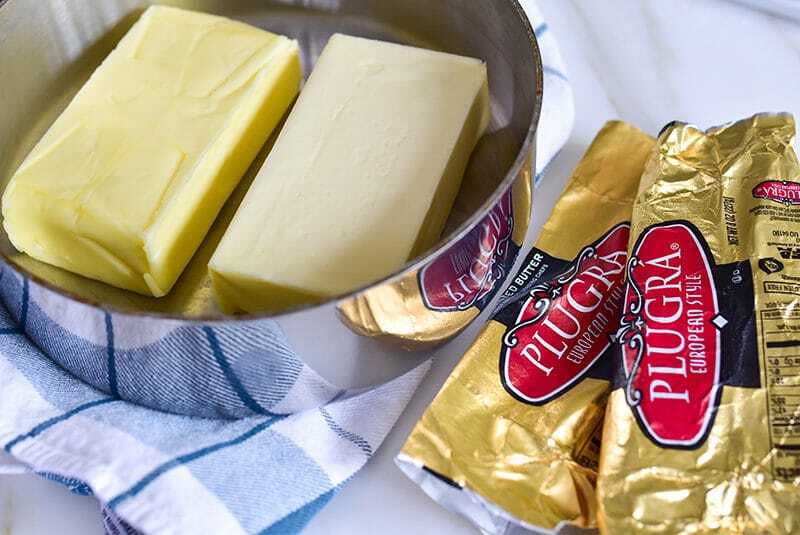 This butter is richer, more flavorful, more wonderful in every way. Salted or unsalted, either way is fine–I used to strictly use unsalted butter only, until one time when I had only salted butter on hand. Mom was there and said “honey, it will be delicious with salted butter.” She was (of course) right. Brands to look for: Plugra, Kerrygold, Land O Lakes European, or Organic Valley European. The butter must be clarified because the solids will burn and look terrible on the baklawa. 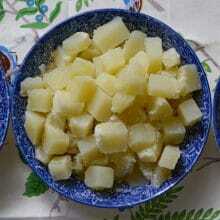 Clarified butter is simply butterfat removed from the solids. It’s golden and translucent. 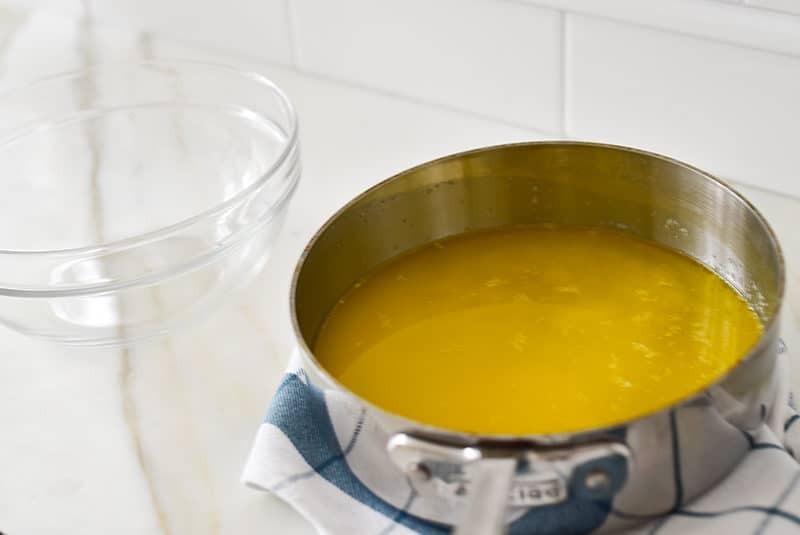 Click here to see how I’ve clarified butter over the years, and there is a method in my cookbook. Lately, I’ve taken to melting at least one pound of butter on low heat (there is always, always a container of clarified butter in my refrigerator). Use low heat to avoid agitating the clarified butter and the solids, which clarifying is meant to separate. Most of the solids will settle on the bottom of the pan. There may be some foamy solids floating at the top. Remove these with a spoon, then pour off the clear butter, leaving the solids in the pan. Some of the clear butter has to stay behind so with the solids because it can’t all be poured away without getting solids mixed in at a certain point. Don’t feel wasteful; it’s okay. I figure it’s only about a teaspoon of clear butter anyway. Plus you can use it on vegetables, mmm. Sugared nuts, of your favorite sort. My favorite is hands-down walnuts. But also: almonds, pistachios, cashews. Toast your nuts in advance, then it’s not “just another step” you’ll be tempted to skip in the moment of setting out to make baklawa. When you get your nuts home from the market, toast them for 10-12 minutes at 350° Cool and store in the freezer. You can even grind and sugar them in advance, and freeze. Grinding the nuts has its nuances as well. The goal is not to end up with powdered nuts, or too much powder at all. The nuts should have plenty of little nuggets. This is easiest to achieve in a hand-grinder. Another cousin (aren’t I lucky?) sent me the grinder that our mothers and grandmothers preferred and that I prefer. 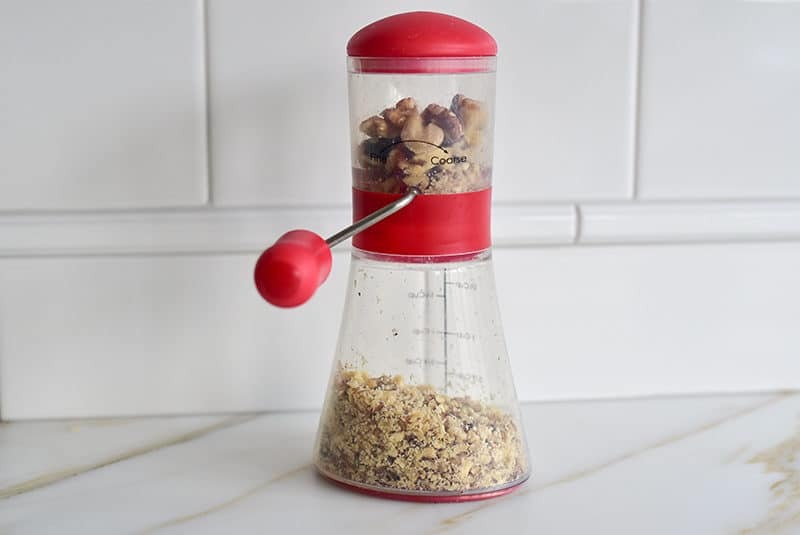 A food processor works and I often use it but watch yourself, pace your pulses, and take care not to take the nuts too far. Measure the nuts before grinding. 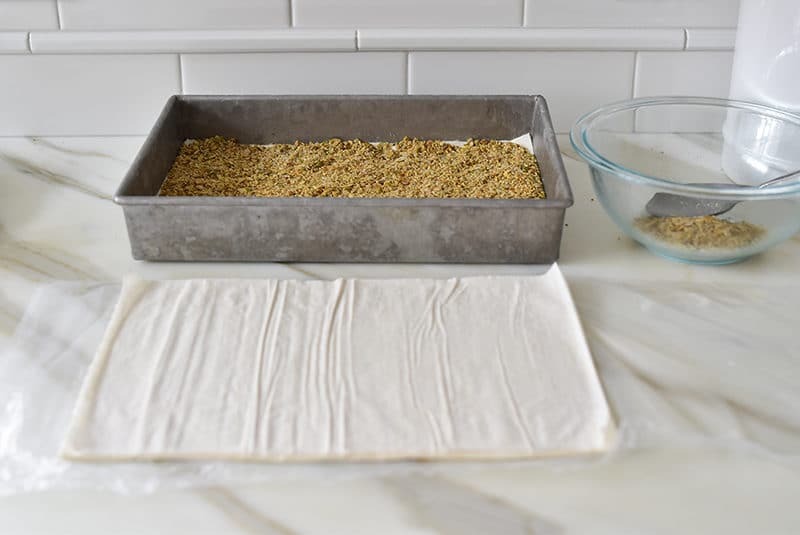 This is important for baklawa made in a sheet pan so that there isn’t too much filling. I measured after the day we made the baklawa video and wound up with too much in the middle. Good thing you couldn’t really tell…. If you’re rolling the baklawa, the quantity of nuts is controlled for each roll so your overall total quantity of nuts matters not at all if there are too many. A tidbit about the nuts that I picked up from Aunt Rita (among the many): don’t put orange blossom water on the nuts. Makes them soggy, she said. Aunt Rita was after crunch; I am after crunch. Any leftover sugared nuts go right into a Ziploc baggie in the freezer. To measure the already-ground nuts that are leftover, go scant by ½ cup for the diamonds recipe. Baklawa is fundamentally buttery layers of phyllo. How that butter reaches its destination is up for debate. That same Aunt Rita baked so much baklawa (she rendered 50 pounds of butter every Christmas. FIFTY!) that she came up with brilliant efficiencies. She put a stack of phyllo in the pan, then the nuts, then another stack. Cut, then pour her butter over all, letting it seep in. All I can say is: THIS WORKS! 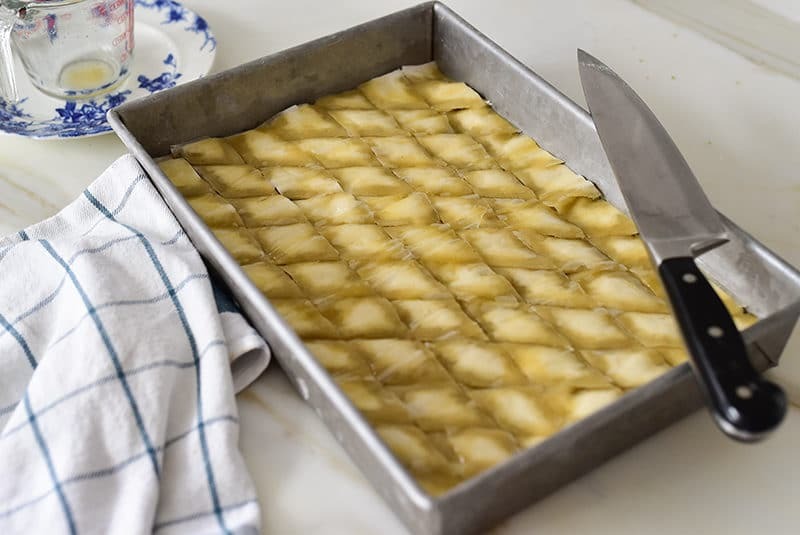 To make baklawa rolls, these layers have to be buttered individually before rolling them up, or else they’ll dry out and crack. So if you’re going to butter layers, make rolls. For diamonds, pour over. Now would be a good time to be sure your knives are sharp. I sharpen at least once a year. Aunt Louise uses an electric knife, and while I see that we have one that she must have given Dan years ago, I’ve never used it. I think it’s probably one of those innovations that makes a huge difference and once I do use it there won’t be any turning back. Til then, it’s a very sharp chef’s knife. Always cut the baklawa before baking, and cut all the way through to the bottom of the pan. Then, after baking and drenching in syrup, the pieces will need to be cut again with a sharp knife as they’re served. In my 9x13x2-inch pan, I’ve taken to making six columns lengthwise in the pan rather than five. The number of columns you make will affect the size of each piece. When I want smaller pieces (and I do, always–they’re just easier to eat), then I cut six columns. The diamonds are then made by cutting on the diagonal from the short size of the pan (at the top in the photo below) diagonally over to the long side. You go by feel on this as to how far apart to space these diagonal cuts. I line up the knife blade along the where I’m about to cut to see the diamond shape before I cut. Practice makes perfect…. Again, room for debate. Shaheens bake it light and delicate with an end result that’s rather chewy. Aunt Hilda did same (because she learned from Louise Shaheen). Aboods go deep golden brown, with an end result that is crisp. Baklawa will lighten up in color in the days after it’s baked; this is not an illusion! Another reason besides great flavor and texture to bake it longer, no?! When the baklawa comes out of the oven, pour the cold syrup evenly over top, and listen up! The beautiful sizzle of the cold syrup sinking into the hot pastry is matched in your baking pleasure only by the incredible aroma of the baklawa. 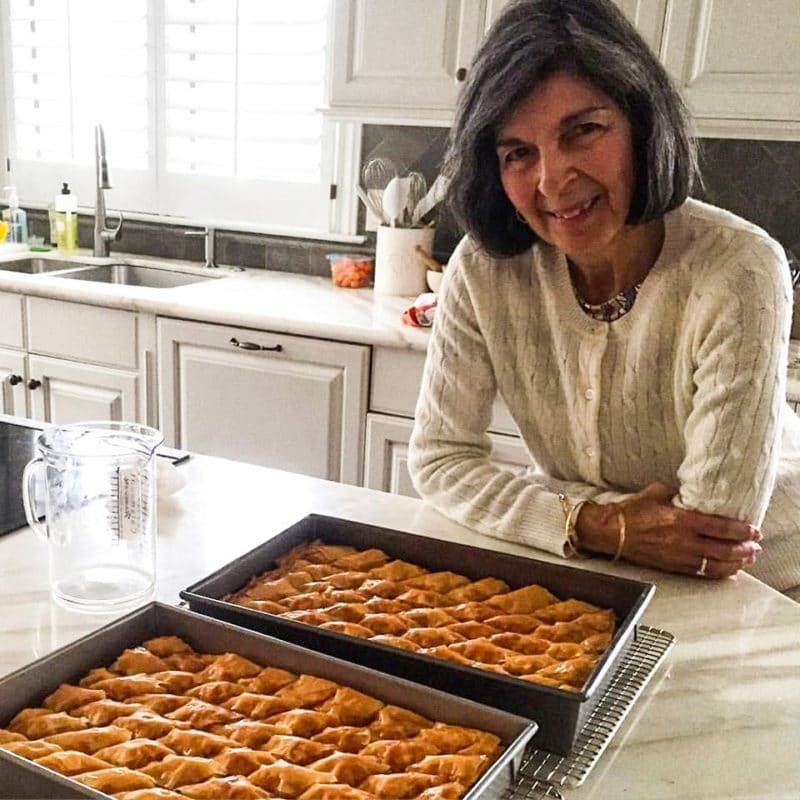 Keep the baklawa in the baking pan until serving time; it will keep in the baking pan for two weeks by my calendar, and a good month by Aunt Hilda’s. Cover the baklawa by lightly topping it with a piece of wax paper or parchment, leaving it loose on all sides and barely touching the top of the baklawa. This is really just to protect the top and not because the baklawa needs to be covered. Once the pieces are cut from the pan, they begin to dry out. The cut baklawa pieces should be eaten within a couple of days. 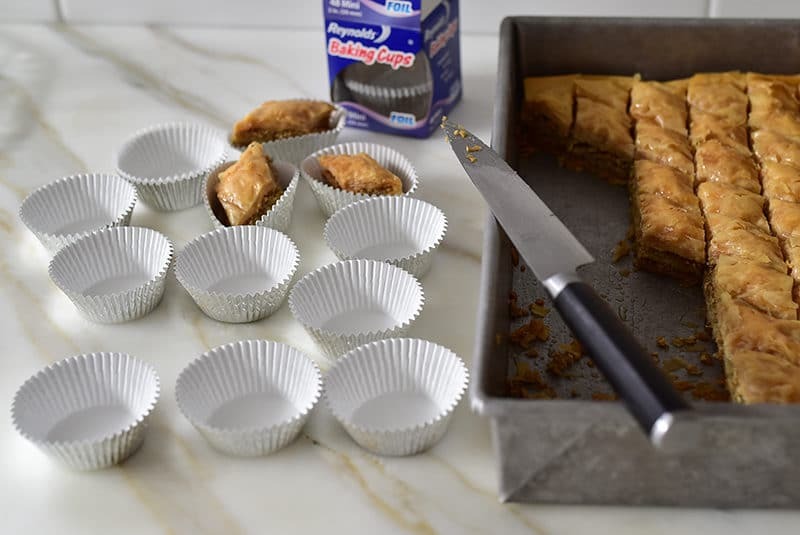 It is traditional around here to cut the baklawa pieces from the pan near the time it is to be served of gifted, placing the pieces in little foil cups (foil mini-muffin cups, of which I have a near-lifetime supply from my sister-in-law Carol!). Use a sharp knife and follow the lines you’ve already cut. 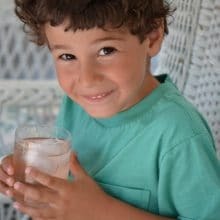 You’ll find all of the recipes in my cookbook, Rose Water & Orange Blossoms: Fresh and Classic Recipes from my Lebanese Kitchen, and also here on my blog. Watch my how-to video here. More ways to clarify butter are here. 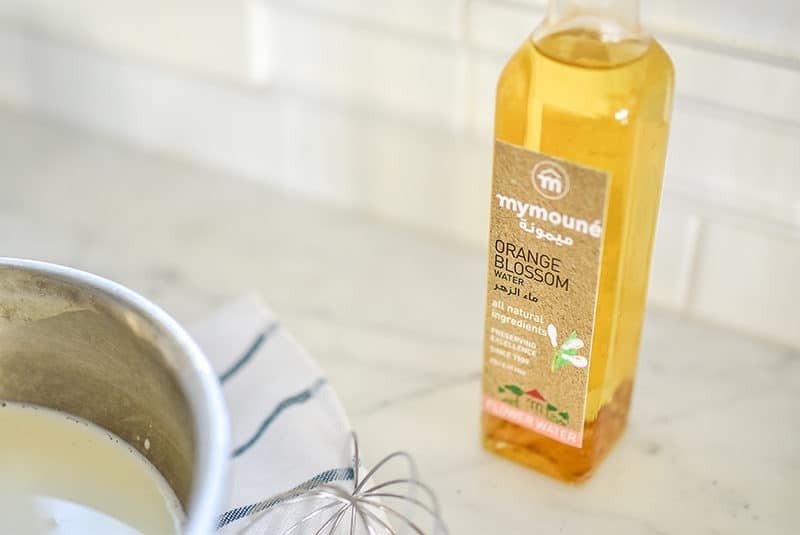 How to make orange blossom syrup is here. The Walnut Baklawa Diamonds recipe with Aunt Rita’s super-simple pour-over butter method is here. Almond thin rolls, or fingers, are here. I’d love to know YOUR tips, tricks, and baklawa-baking secrets. I know you have them! Share here in the comments please and thank you! 24 Responses to "How to make Lebanese Baklawa"
As I’m Greek, I use honey in my syrup. All kinds of different honey. Orange blossom from Florida is my favorite. I also place a whole clove in the center each diamond and lightly spritz with water before I bake. I now use your method of “layering”. So much easier! Sounds so good! I like your water spritz idea Niki! I’m with you – bake longer is better-but that pour it all on top after assemble- I can just see my TaTa rolling her eyes in disgust. The time I made it with her – everything was going at the same time butter clarifying, syrup boiling, phyllo drying out nuts toasting – I couldn’t move fast enough and by God EVERY phyllo sheet was individually buttered both bottom and top! Whenever I read your recipes – my TaTa come back alive again – thank you for that!! Merry Christmas my friend. Oh yes, I bet her kitchen was a total machine! That’s a gift to have had that experience. 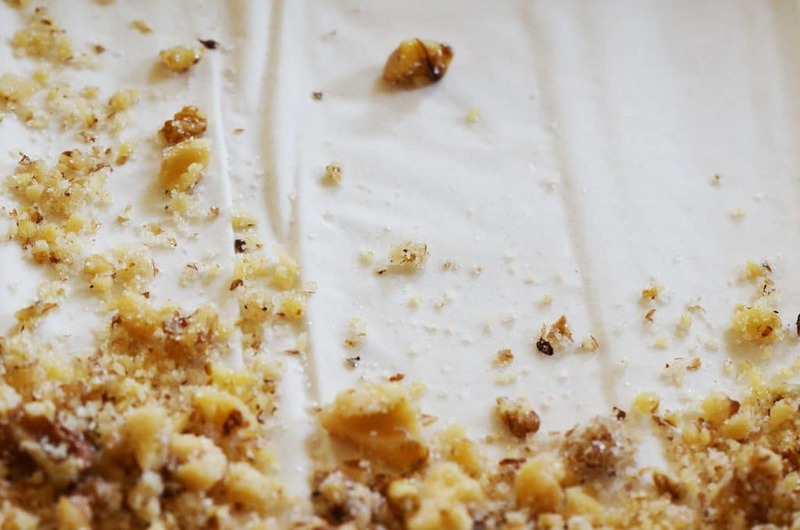 And no way she’d approve of our easy method…til she tasted it (but even then, skeptical!). Thank you Margaret and Merry Christmas to you and yours! Love the pour over tip! I find that Baklawa freezes well. Can you share what types of pans you are using? Hi Pat–I like the traditionaltouch straight-sided 13x9x2 rectangular pan from Williams-Sonoma. Calphalon also makes a good straight-sided pan. This is such a helpful post! I always stay away from preparing these sweets because of the amount of time it takes to make (also because I find myself finishing off a tray in no time at all!). Maureen, not that I want to give away family secrets but, after clarifying the butter we put it in a spray bottle and spray each sheet. Place newspapers on the table for easy clean up of any overspray. This is much quicker than a pastry brush. THIS IS REVOLUTIONARY!!!! I’ve told both my mom and mother-in-law and they were tickled to hear this innovation, as am I. Bless you for giving away the family secret!! I can’t wait to try it. In a different note, one aspect that troubles me is using aluminum pans. With all the research related to aluminum and disease, I wish that we had another alternative. Could it be baked in glass? Are there stainless steel pans? Where do you buy your pans? 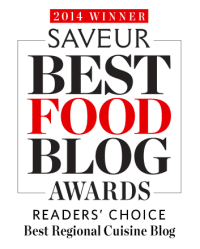 Thank you for all of the wonderful stories and recipes you share!!!!! Thanks so much Michele–I haven’t tried the baklawa in a glass pan, but I’d be curious to hear about it. The curved corners aren’t great but may be worth it to you to avoid aluminum. My straight-sided pan is aluminum-coated steel from Williams-Sonoma, “Traditionaltouch” collection. My sister and I gave your book to our siblings for Christmas. Big hit!! Thank you. SO heartwarming for me to hear this, thank you!!! Thank you for the wonderful recipes! The pour over technique sounds interesting. Doesn’t make the nuts soggy? 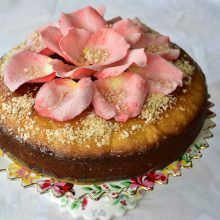 You also mention the recipe from your “(beautiful mama! ):” but there is no recipe or link after the colon. Can you correct? Thanks. May I say , I love your writing! I was raised in the kitchen with my Sitty, mother, aunts , sisters and brother and your stories remind me of living at home with my mother. Question; I’d Like to serve hot baklawa Christmas Day, do you think it’s possible to prepare the baklawa Christmas Eve and bake Christmas Day? Thanks so much Kathleen! I don’t think you’ll want to assemble the baklawa a day before baking it, because the phyllo dries out so fast. Even covered with butter, I’d be concerned holding off on baking. But, if you have all of your components ready (nuts toasted, chopped, sugared; syrup made and in the fridge; butter clarified and measured; phyllo thawed overnight in the fridge then room temp for a couple of hours), the assembly will be fast for baking and eating it hot on Christmas day. I’d let the baklawa rest a good 15 minutes before serving it so that it holds together when you cut it from the pan warm. 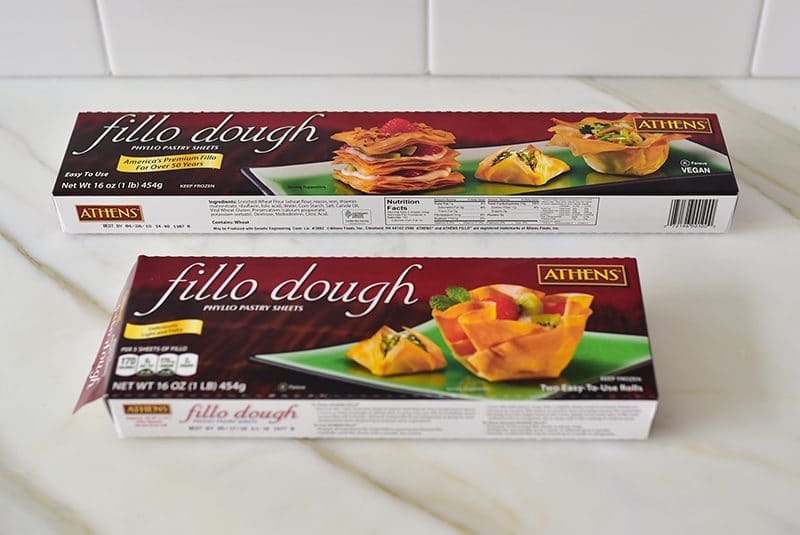 Hi there–when you purchase the shorter phyllo sheets (9×14″), there are two sleeves in one box. My recipe is for this size, and you need one box only. Thank you for all these wonderful recipes! I love pistachios but have had trouble keeping them green in the baklawa (like they do in the Middle East). They are not as sturdy as the walnuts and over brown easily. Although, I have not been toasting them prior to baking, like you recommend for the walnuts, they still get brown. I am wondering if I should add orange blossom water to them although it was not recommended for the walnuts. What do you think? Hi Reem! I hold off on adding the flower water to the nuts, just because I like them to be as toasty and crisp as possible and the flower water makes them softer. The flavor, though, is great; if you don’t mind the softer nut texture, you can absolutely add the orange blossom water to the pistachios. Keeping them green is not easy and I’m very interested in finding out how to achieve the very bright green we see in our pastries from the Middle East. I buy ground pistachios that are bright green also, and I don’t think they’re died. So more on this subject to come! Are You related to The Abood , that lived in Akron . There , Family in Detroit , I , think Marie and Walter Abood , and had 4 or 5 children. . They would Visit my Parents , they were In Akron. Wonderful Family . Thanks. Paul Salem . I make all Lebanese pastries , got the Recipe , from the Lebanese Friends . Hello Paul! We may be related to that family but I don’t know them personally. But small world! I bet your pastries are divine. Very neat, keep in touch! Love to hear what you’re baking.